Today's weekly round up is quite a lengthy one as I have been loving lot's of things this week. Up first for makeup is the Emite Makeup Diamond Primer which I received in this months Glossybox. I have been trying this out this week and after the first use, I just love how it looks on my skin. It has a peachy tone so it helps to correct any discolouration and add a beautiful glow to the skin. 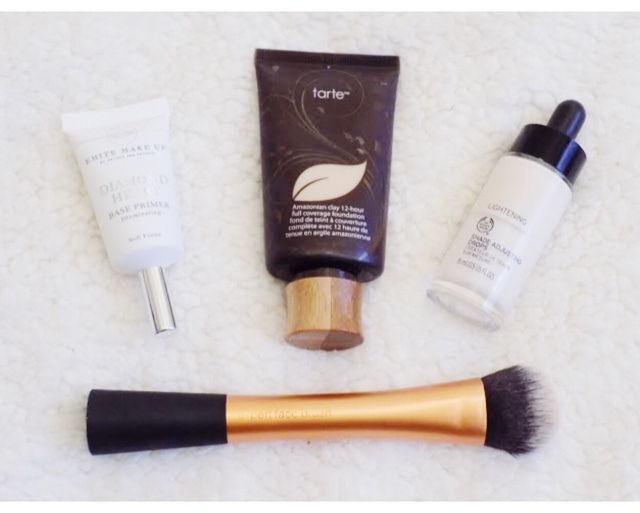 I have then been using the Tarte Amazonian Clay 12-hour Full Coverage Foundation with the The Body Shop Lightening Drops and the Real Techniques Expert Face Brush. I was looking for something a bit fuller coverage and longer lasting and now I have these lightening drops, I can make this Tarte foundation match me 100% and I love it so much more now. I only need one drop of the lightening drops and with this particular brush, the foundation blends in seamlessly and so effortlessly it doesn't even feel like I have anything on the skin. I love it. 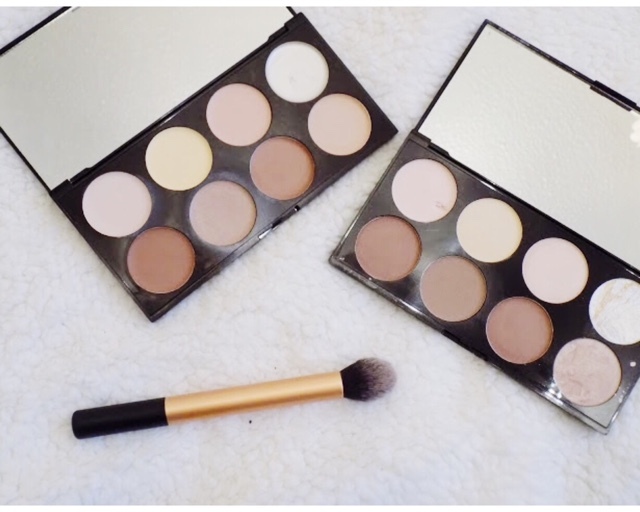 I have absolutely loved contouring this week and that's all thanks to these two palettes, the Makeup Revolution Ultra Cream Contour and the Contour Palette. I've been applying the cream contour on first using and then the corresponding shade but the powder formula and I think it has made my contour look so much better and you can still see it later in the day because I am setting the cream product with a powder to make it last longer. I have been loving using the Real Techniques Contour Brush as it is the perfect size and shape to get into those cheekbones and along the hair line without going over the top. It looks amazing and I will definitely show you how I achieve it in a post soon. Now for the eyes and the MUA Undressed Eyeshadow Palette also from this months Glossybox has been a great addition to my collection this week. 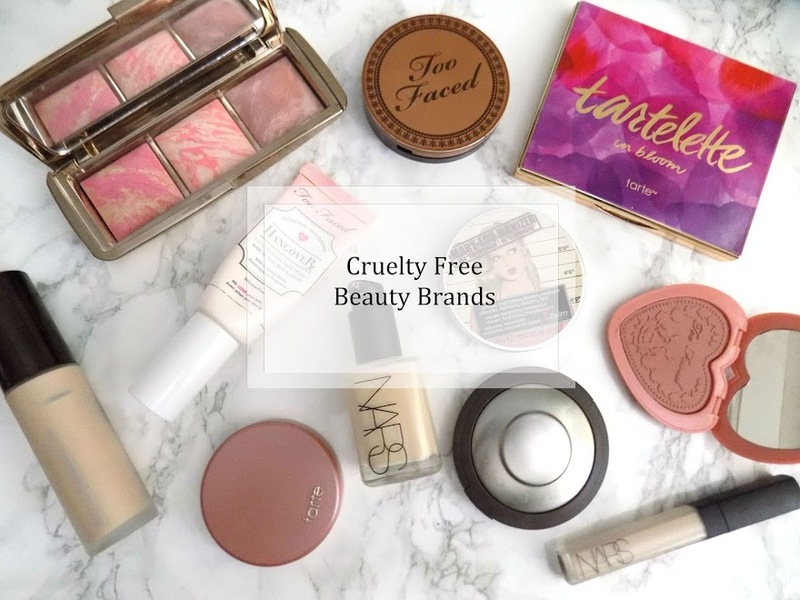 It is very similar to the Urban Decay Naked Palette so I have been creating some very everyday appropriate looks which is what I look for in a palette. I wouldn't say they last as long as some of my other shadows but for the price they are great eyeshadows. As for mascara, I have been trying out the newest mascara to my collection, the Clinique High Impact Mascara from December's issue of Glamour with the lovely Tanya Burr on the cover and I love how this mascara makes my lashes look. It's quite a natural mascara but you can certainly layer this up to really add a statement and I love the brush as it's the perfect size to coat the lashes without getting it everywhere. Really like this one. 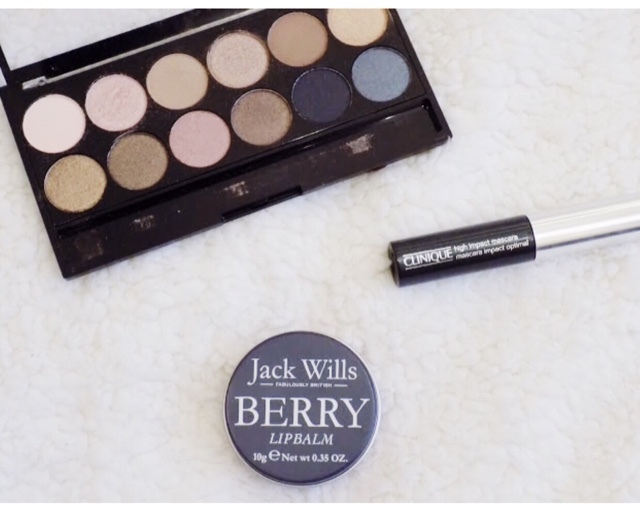 Finally for makeup is the Jack Wills Berry Lip Balm which I have literally been obsessed with the last two weeks. I have made a considerable dent in this as I apply this all day every day and I still love it. It makes my lips feel so soft and the other scents have barely got a look in. I love this berry one and highly recommend picking them up as they're only £8 for all three. Next is skincare and up first are a couple of masks that I have been using this week to help with my skin and this colder weather we've been having. I have dug out and started using the Liz Earle Brightening Treatment Mask as this is something I've used and got on well with in the past. Although I don't have massive problems with breakouts (I only have a couple) I like to treat my skin to whatever it needs and a radiance boost is just what my skin ordered. In addition to a radiance mask, I also like to multi-mask and put on the Soap & Glory No Clogs Allowed Self Heating Mask on the are around my nose and cheeks which are my most troublesome areas. This was I leave them both on for a few minutes and then rinse off. 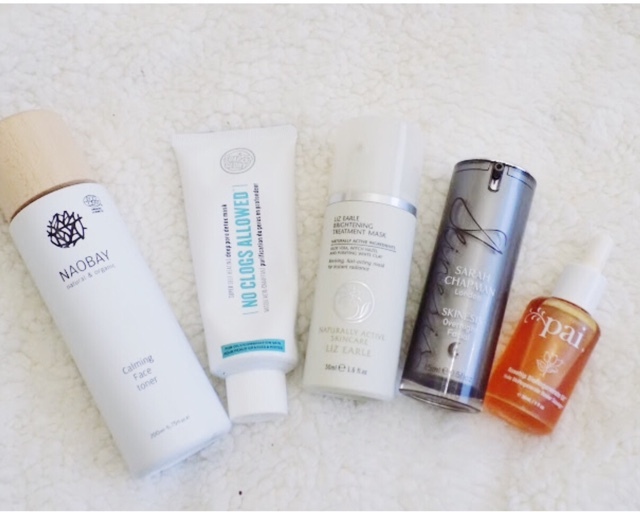 These have done fabulous things for my skins texture and overall appearance and I am really loving these this week. To go along with what my skin has been feeling I started using a toner again this week. I kind of go in and out with toners but I remembered getting this in a beauty box and thought I had better use it and that is the Naobay Calming Face Toner. This is a 4-in-1 product. It cleanses, tones, soothes and removes makeup and impurities from the skin. There's no overwhelming fragrance to irritate my skin and it just calms my skin and gets it feeling normal again. I've only started using this towards the end of the week so I don't know just how well it works yet but it certainly feels good on my skin. Finally for my skincare routine this week is oils. The weather has been pretty icky this week and so I thought I would make sure my skin was hydrated and for that, I always turn to facial oils. You probably recognise both of these but the Sarah Chapman Skinesis Overnight Facial and the Pai Rosehip Oil are my two oils I go back to. So not only do these hydrate and soothe but they help with scars and discolouration as well as dry or flaky patches and also with healing the skin where any blemish or scar has appeared. As for the hair products I've loved this week I firstly wanted to talk to you about my hair colour. You may have noticed in my copper eyes look that my hair was slightly darker. I used this L'Oreal Casting Creme Gloss in Mahogany to keep the darkness in my hair with a tint of red in the light. I am really happy with this colour and I have a back up (shown above) for next time I need to dye it. I like this range of hair dyes the most as the longevity and vibrancy is the best from the drugstore in my opinion. For after I have washed my hair, I've been testing out the Living Proof Nourishing Styling Cream which came in this months Birchbox which you can see here. The only Living Proof product I've tried is their styling primer I think it was which I liked but wasn't mad about it enough to repurchase. But I have really liked how soft and manageable this has made my hair. It's no where near as frizzy as it normally is and fly-aways aren't really an issue for me know. I apply a generous amount all over my hair, comb it through and style as normal and it works great. Not sure if it makes such a difference that I would purchase the full size but we'll see. I've liked using it so far. 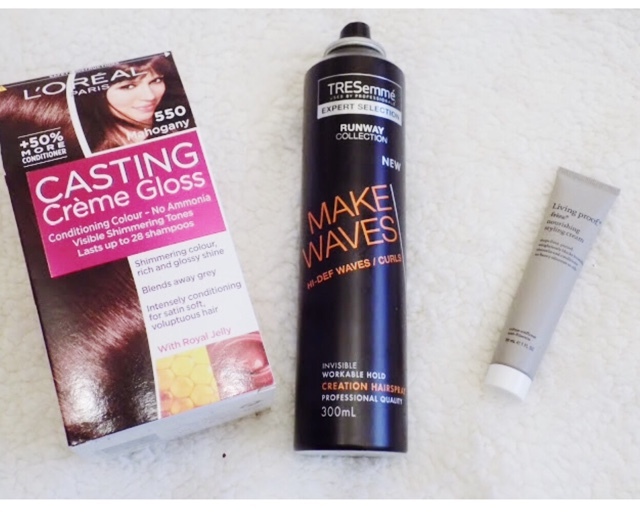 Finally for hair is the TRESemme Make Waves Hair Spray. I know you've seen this a few times now but this week I really feel I have got it down when it comes to using this product. This week I've been going for a wavy, messy curls kind of look and I hold the spray around a foot or so away from my hair and spray it upwards into the ends of my hair. This keeps the wave/curl whilst still being manageable and touchable and lasting all day. It doesn't make my hair feel crunchy or sticky so I really have fallen in love with this this week. Be prepared for a rave about this new TV show that I've found. 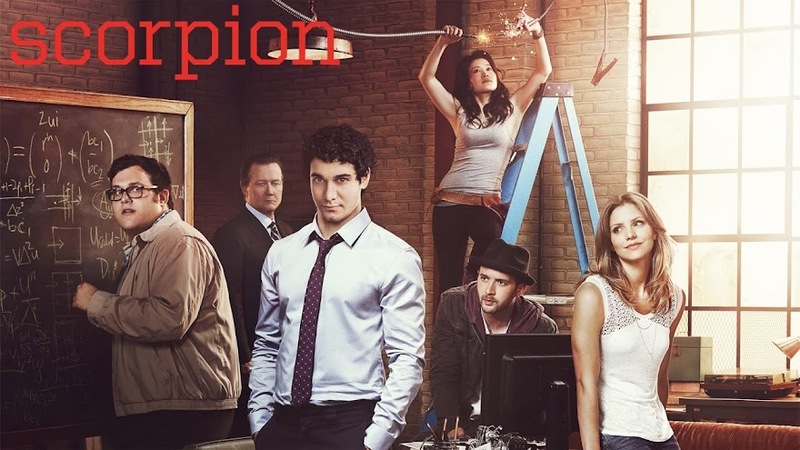 Scorpion, a group of geniuses that work as a team to help Homeland Security save the world, and are a family. I really like the loyalty, the story lines are great and what these guys can do is just incredible. Highly recommend watching this if you haven't already. It's such a gripping show and I cannot help putting the next episode on immediately after. Don't know what I'll do when I finish the episodes that are out. It's available on Netflix so let me know what you think if you have seen it already or end up watching it. 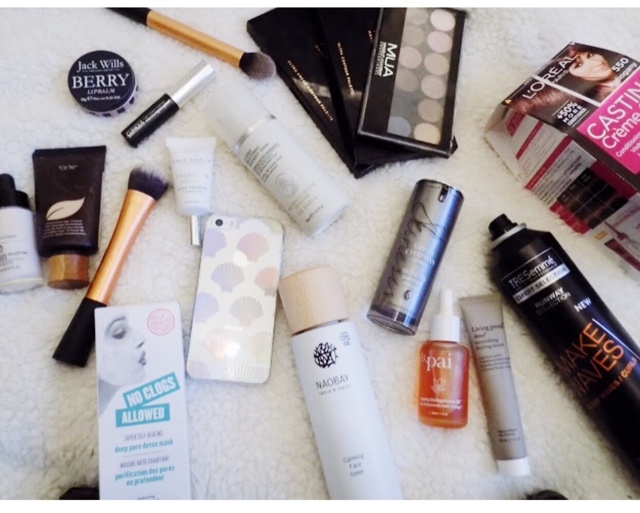 I also really enjoyed Hello October & Amelia Liana Over Rated Products Colab this week. I love watching these kinds of videos as I then can be cautious about buying things that are from the higher end of the beauty price spectrum. 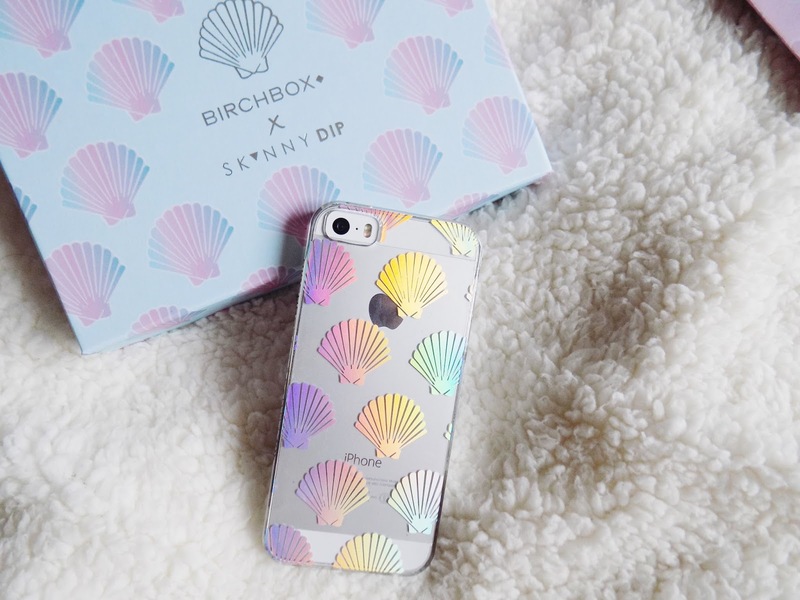 I am still loving this Birchbox Phone Case. Look at how beautiful it looks. Very unique, had lot's of compliments on it and I think it's much more interesting than a plain clear case.